For years, I’ve been collecting vintage Citizen watches. I spend a considerable amount of time researching, collecting, buying, selling as well as restoring and servicing these wonderful timepieces. Sooner or later, it was bound to happen. 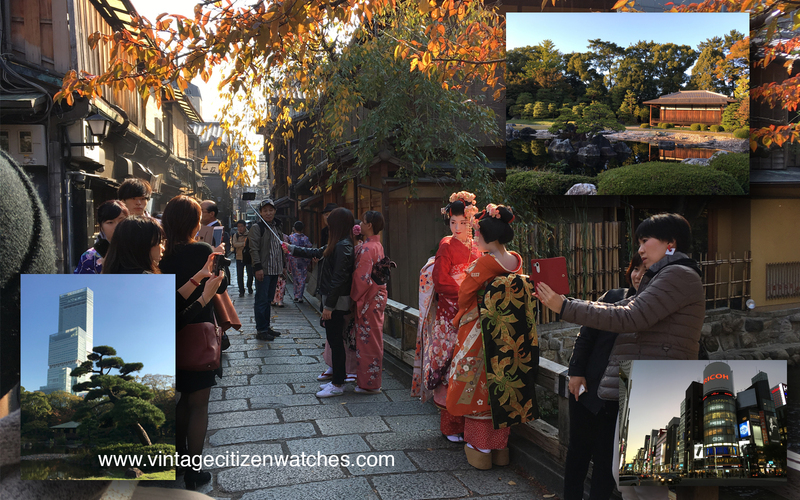 Yes, I had the chance to travel to Tokyo, Japan and be a guest at Citizen Watch co. 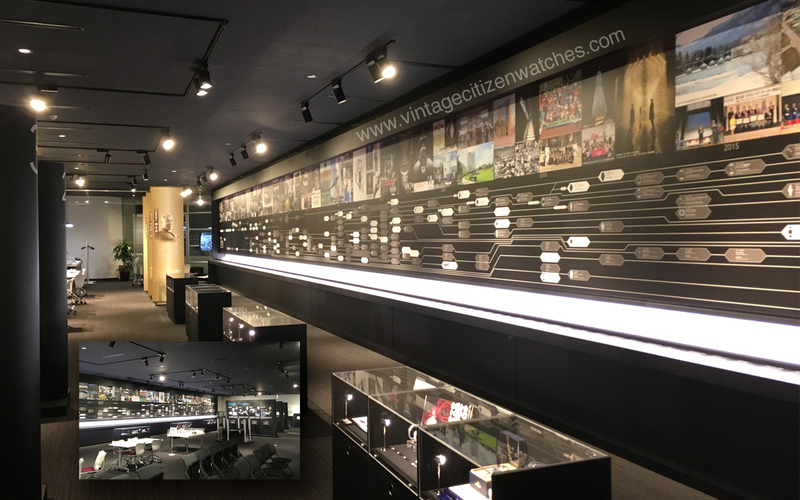 Earlier this year, the company introduced a fascinating new facility – the Citizen Museum. I had the honor of being invited to visit this institution and admire the impressive collection from the company’s watchmaking history. Let me start by saying that we cannot talk about Citizen without taking into consideration that this is a quintessentially Japanese brand, with the nation’s philosophy and lifestyle encoded in its DNA. Japan is definitely a must-see country. We’re all familiar with martial arts, Buddhism and Shinto. We love bonsai, ikebana, origami and, of course, Japan also means Samurais and Geisha, doesn’t it? 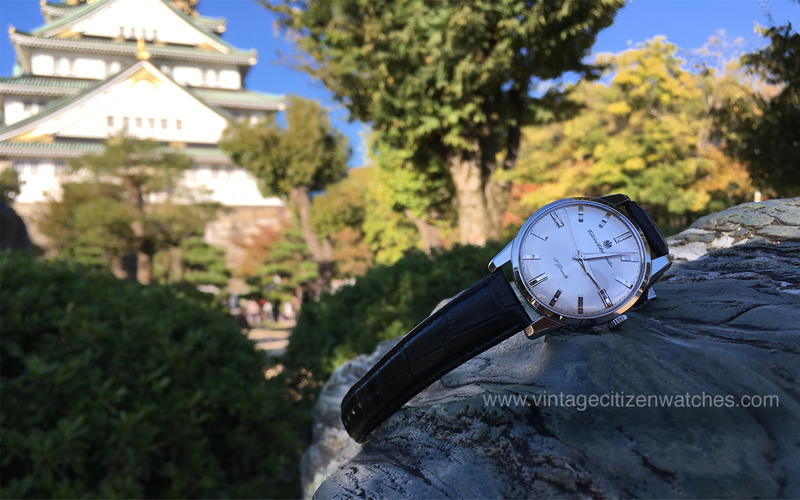 It’s all of those things and so much more: respect, simplicity, tradition, work ethics and pride, innovation, art, philosophy… you can find it all in Japan and, indeed, in the wonderful world of Vintage Citizen Watches. One hundred years ago, the Citizen Watch Co. Ltd. was born under the name Shokosha Watch Research Institute. Mr Shimpei Goto, the mayor of Tokyo, named the first watch “CITIZEN” with the hope that the watch, a luxury item in those times, would become widely available to ordinary citizens and be sold throughout the world. His ambition materialized. “People appreciated and benefited from the institute’s results”. Prophetic words, indeed. With this statement, the seeds were planted for what would become the world’s largest watch manufacturer. In 1924, the first pocket watch bearing the Citizen moniker was produced. One of the first pieces produced by the company was purchased by Emperor Showa, Prince Regent at the time (Emperor Taisho era). In 1930, Yosaburo Nakajima laid the foundations for the Citizen watch empire. In 1936 the company expanded beyond the boundaries of Japan, exporting watches to many parts of Southeast Asia. This was the starting point of going global and the reason we can all enjy these watches no matter where we are. This is the watch I strapped to my wrist on Monday morning. It is the stainless steel Chronometer and you can read about it HERE. I like to believe it was a great choice, since our host seemed impressed. This model was also on display at the museum, not once, but twice – as a whole watch and in a section discussing its movement. At 9:00 we were at the Citizen headquarters and we had no problems getting there. Once we got out of the train at the Tanashi station, the Citizen logo on their building was easy to spot. We took a short walk and reached the gate. Because the trains work really well in Japan, we were able to schedule out trip with such precision that we arrived at 8:57, since our meeting was at 9:00. The doorman was aware of our visit and someone walked us into the waiting room. Two minutes later, at 9:00 sharp, we were met by Ms. Wakaba Kuroshima (Product Management Section & Product Marketing Department) with whom I had communicated prior to my arrival. She was very helpful in providing all the information needed in order to get there in time and also a few welcomed pieces of advice about what to do in Tokyo. She took us into the museum. Mr. Yasuyuki Sakamaki (Citizen Museum Director & Citizen Archives General Manager) along with Mr. Takeo Ishino (Manager Product Management Section & Product Marketing Department) and Mr. Shoiji Misono (Manager Product Planning Section & Product Marketing Department) welcomed us. They were all extremely gracious and evidently proud of their work and their company. Everything was clean, neatly arranged, well-planned and executed. Our hosts kindly showed us around and answered all our questions. 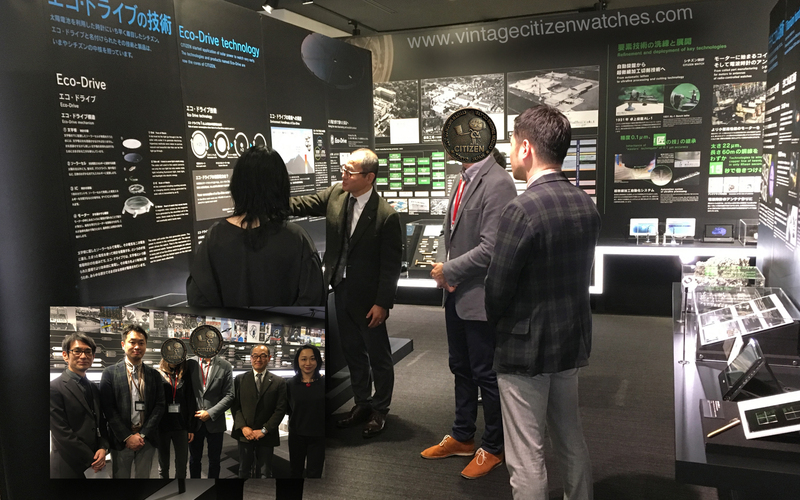 Our tour started with a short film that rendered some of the most important events in the history of Citizen and a few of the innovations made by them throughout the years, and there are a lot of them. After this, we were invited to see some watches, important pieces, hand-picked by our host and guide, the museum director. There are 130 watches on a 24-meter-long display. The 24 m represent the hours of a day. So we can witness 100 years of development in one single day. 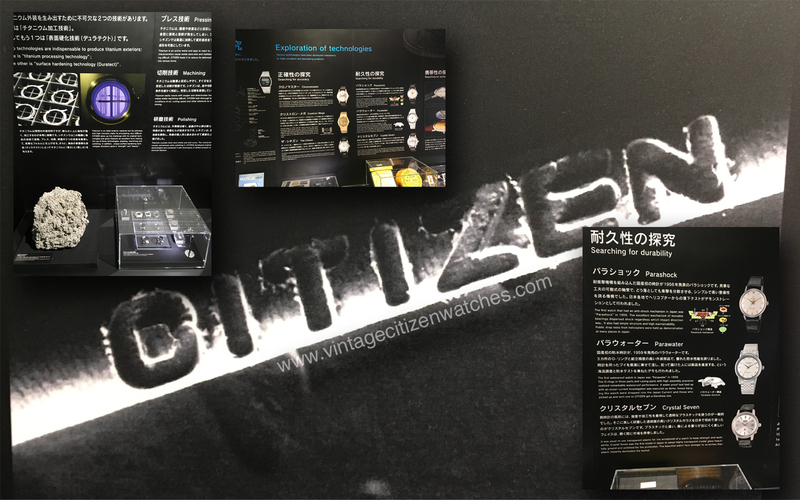 We learned so many things about Citizen: the first titanium watch, the first Japanese water proof watch, the thinnest movement at a certain time, Guinness World Record for smallest watch movement, Eco-drive technology, radio wave…. and so many more world or Japanese premiers. 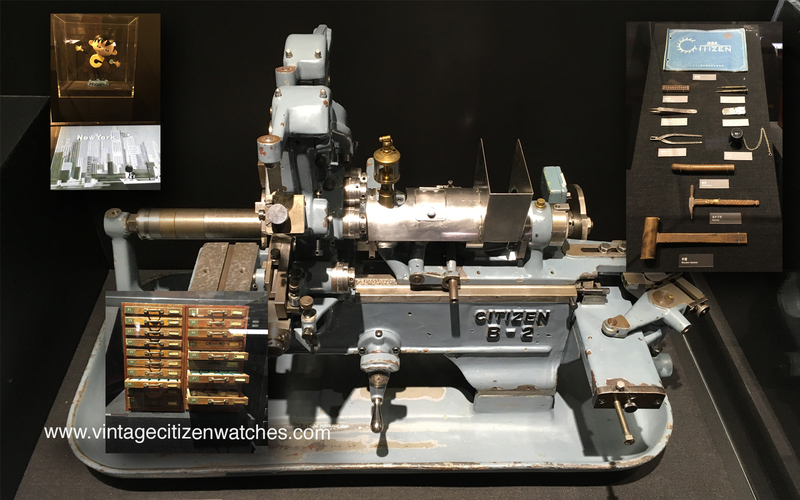 The tour also introduced us to some machinery and because Citizen is a truly in-house made watch, the company manufactures the machines that make the machines that make the watches! How cool is that?! And Citizen is not only watches; they also produce car parts, led lights and a lot of other non-watch-related things, all with the greatest dedication. Inspiring! After the tour, we sat down for coffee and I had the chance to ask a few questions. Next year Citizen will be celebrating its 100-year anniversary. How does it feel to be reaching such a milestone? We are proud of these one hundred years, but it is not the end. We don’t see it this way. It is only the beginning of the next 100. How do you imagine the next centenary? We focus a lot on the future and at the same time we treasure and cherish out past, the tradition. What we are aiming for is to look ahead and continue on our path the same way. Trying to improve, to be better. Will Citizen go mechanical high end? I know Citizen has made a tourbillon, the Y01. Yes, but it was a one-time thing and we have no plans of pursuing this path in the near future. In fact, there were only two pieces made. How do you view the past? Citizen made awesome watches and we love them so much! We are very proud of our past and we have a few watches on display that we treasure. Citizen had the same philosophy for a long time and the past watches, the present ones and future ones will show it too. Citizen had a lot of global and Japan “firsts” and we were always looking to improve, to offer a better product. Do you have an archive for vintage? Do you service them, offer parts for restoration? Citizen doesn’t keep an archive and doesn’t offer service and parts for watches unless they are in the warranty period. Do you encourage the vintage market for VCW? At the moment we don’t have a plan in this direction. We appreciate collectors such as yourself and are amazed by your watches and your passion. Why do you collect VCW and where do you find them? For me, as a collector, I find a lot of diversity and quality still at a very reasonable price. My father had a Citizen, a blue-dial, that he bought when I was born. It was quartz but still made me love the brand. Finding them is not easy… I’ve spent hours every day for years, looking for the best pieces. Thank you, we are humbled and honored by the passion collectors invest in our brand. Will Citizen recreate some important historical watches? A lot of brands are investing in this direction. 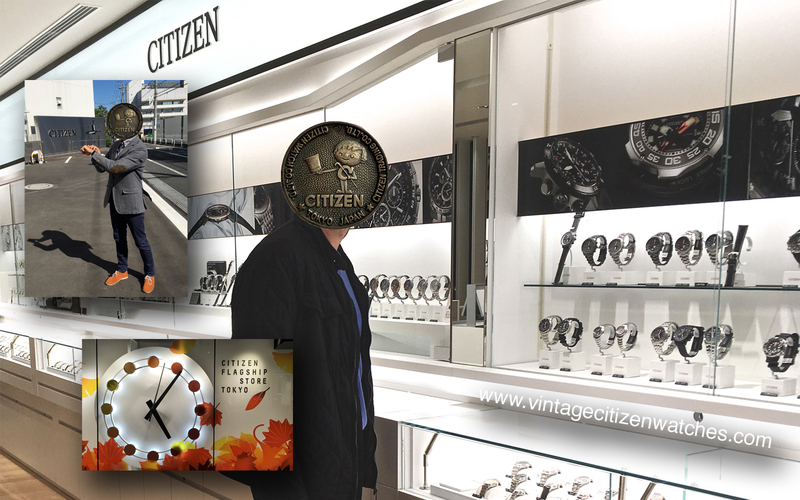 Next year is going to be Citizen’s centennial so… (spoiler alert – you heard it here first, on VCW) we are going to present a homage watch. But because Better starts now… we don’t search into the past, we are proud of it but we go forward and in fact we have several directions to follow. Wow! What model will it be? That is such a great surprise. I’m sure the readers will be thrilled. We can’t say right now but we will introduce it to Baselworld next year. You are invited to see it there and hopefully we will meet again. What I can say is that it is in the final stages of development. Thank you so much! I will wait for it and will probably meet you again there. Do you have a message you would like to share with the fans of your brand? Next year is an important passing point, (100 years) we look at our history but this is the beginning of the next 100. We try to send this message at Baselworld. So keep an eye on Citizen! Thank you again! Arigato gozaimas! Back to my visit, a few images that I hope you will enjoy. In the picture above you can see the Parawater and the Pacific buoy, in the picture below you can see some old machinery, some old tools and the cabinet (all made by the Citizen company). The past was impressive and this is why we love it so much. They were trying from day one to provide the best watches they can do at affordable prices so everyone could get such a luxury item. Divers, chronographs, complicated watches… elegant ones in stainless steel or gold, platinum, titanium, stone, wood… and everything you can think of. Citizen was always pushing for a better watch and a better one. Their motto is Better Starts Now” and they promise and they deliver. As a conclusion: awesome people, awesome company and awesome watches! 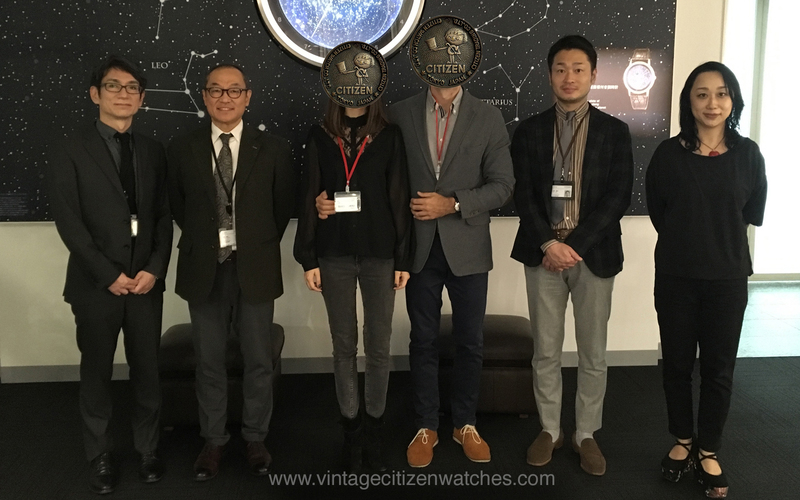 If I was a big Vintage Citizen Watches fan before the visit, now I am twice as much. 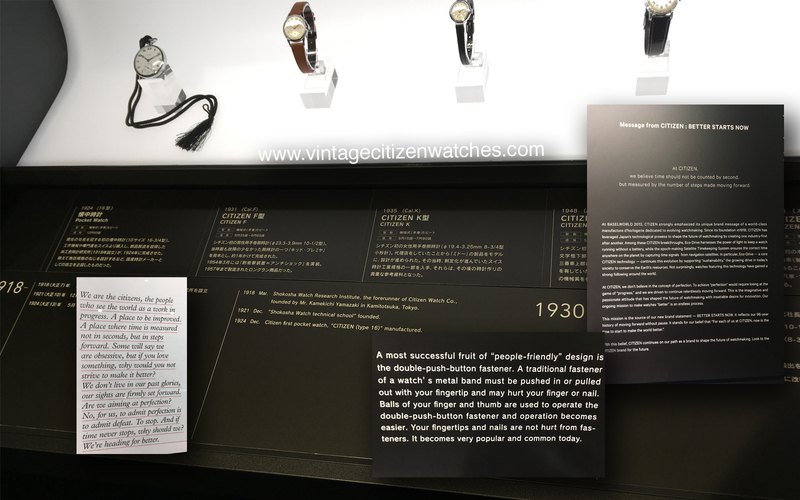 I was so impressed by the modesty, respect and the warmth of the people at Citizen…. and a company is only as good as the people that work there. They do it with such love, respect and dedication! Love it! Thank you Citizen, thank you all and I hope you found useful information here. Also, you can join the Vintage Citizen Watches Facebook group HERE. 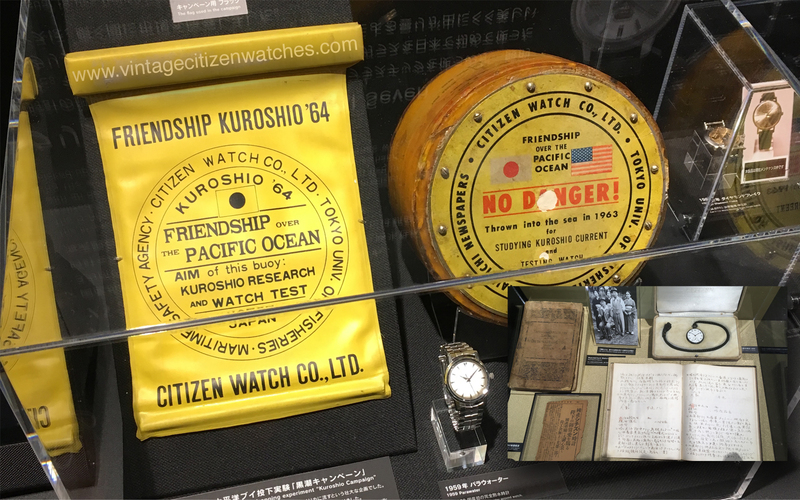 This entry was posted in Citizen history and data, Uncategorized, vintage Citizen, watch service and tagged automatic, chrono master, chronometer, citizen archives, citizen bogdan, Citizen chronograph, citizen museum, citizen vintage diver, display, diver, Eco-Drive, geisha, innovations, Japan, parawater, quartz, Shoiji Misono, Takeo Ishino, Tokyo, vintage citizen, vintage watch, Wakaba Kuroshima, world records, Yasuyuki Sakamaki. Bookmark the permalink. Hey, just wanted to let you know that I really enjoyed reading about your fascinating trip to the Citizen Watch Museum in Japan. I was also astounded by the precision of their railway system. I also had the opportunity to visit Japan – was there just last month! While there, I definitely enjoyed checking out the Seiko and Citizen watches in the shops. I wish I had known about this Citizen museum beforehand as I would have made time to visit. I have to admit that I did not pay much attention to Citizen watches until finding your trip report – I think you may have won me over. VintageCitizenWatches has now been bookmarked!